Liberty Star is a working ship; working 24 hours a day. Join me for a short tour around this unique ship! Come on inside! This deck is the highest level above water other than climbing one of the radar, radio or signal masts. From this deck, the Bridge watch team has a good view of the surrounding sea and with only minimal effort a person can move quickly to observe all around the ship. 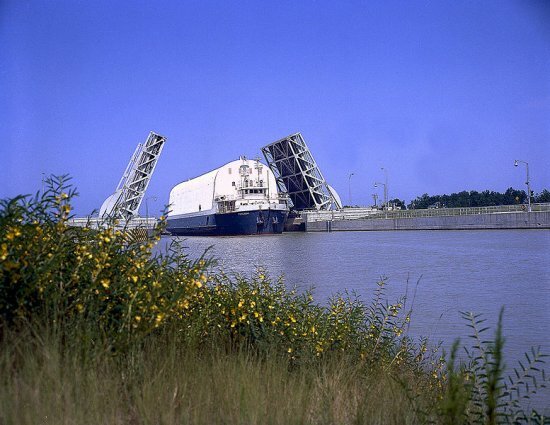 The Bridge holds ship maneuvering controls, the cluster of navigation and communication equipment necessary to safely control booster recovery operations and sail the vessel through busy sea lanes to and from Gulfport, Miss. 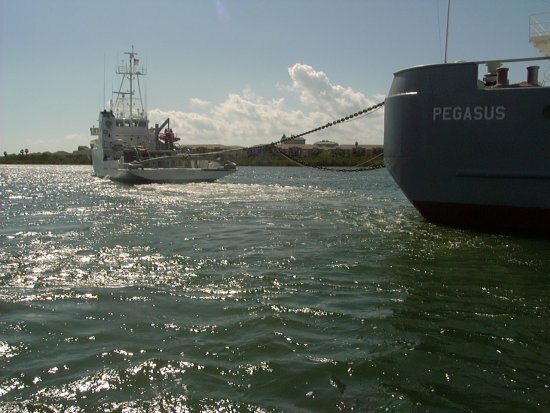 The Gulf of Mexico and Florida Straights are very busy waterways and require much vigilance, especially for a vessel maintaining a quarter-mile tow. After normal duty hours the ship is controlled and monitored by the watch, a small team which performs all the important normal functions but with fewer members of the crew. Not surprisingly lighting is very important to ship safety. Power-driven vessels, like Liberty Star, are required to conform to standard maritime lighting rules; the starboard (right side looking forward) side of the ship is lit with green lights, while the port side (left) shows red lights. The stern or aft (rear) of the ship displays a white light; the main mast has a forward looking white light; and the mast on the bow of the ship has another forward looking white light known as the range light. The job a vessel is engaged in is also indicated by her lights. For towing astern, Liberty is also displaying an additional amber light astern and two additional white lights on the foremast to indicate that she is towing astern, length of tow exceeding 200 meters. As ancient a tradition as it seems, the Liberty Star maintains and regularly uses a standard set of nautical flags to communicate its status or intentions to other ships or aircraft. The International Code of Signals uses a set of 40 nautical flags. These signals were created to aid communication between boats, in both times of calm and distress. Each flag has a letter equivalent, and can be used to spell out messages. In addition, some flags have individual meaning and can be used by themselves or in combination with others to convey a message. For instance, the B-flag or Bravo flag is all red and indicates a vessel carrying or transferring dangerous cargo; the H-flag or Hotel flag (white and red) signals a pilot is on board the vessel helping the Captain steer in unfamiliar waters; the O-flag, Oscar, is yellow and red and ominously signals a man over board; and the flag with a white background and red x stretching from corner to corner indicates a ship requiring assistance. A very common nautical flag to Americans — frequently seen on automobile front bumpers — is a red background with a single white flash, indicating a diver down, is now an accepted as an international signal for a diver. The internationally recognized signal for diver down is the A-flag or Alfa flag and is white and blue. Many nautical flags signal the plight of seafaring vessels, such as dragging anchor, making no headway or on fire. Aarg…! Today, displayed proudly high on the main mast is a flag with which you are intimately familiar; our national colors, the good old Stars and Stripes, looking good, holding fast, flying high. They’re certified, for sure: Each member of the crew is certified, that is, they’re qualified to perform their respective tasks and responsibilities. On Liberty Star crew members’ certificates of qualification are posted for all to see on the bridge. Together, the certificates literally mean tens of thousands of hours of study, examination, assessment, experience and know-how within a single ten-person crew and many of the crew members are qualified as captains of vessels by their own right. For instance, in addition to Captain Nicholas, Chief Mate John Bensen and Bosun’s Mate John Jacobs also hold Captain’s licenses. Immediately beneath the Bridge Deck resides the small 0-1 Deck. 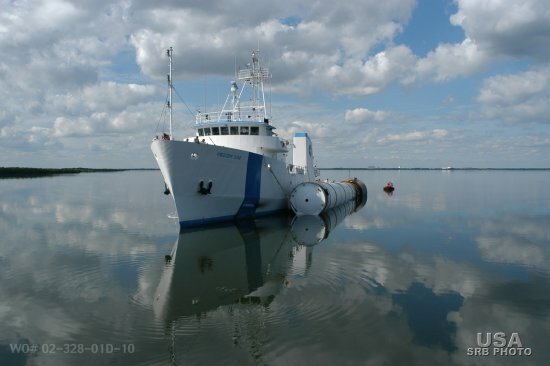 The 0-1 Deck is quite limited providing only the quarters for the Captain, as well as working and sleeping quarters for visitors such as scientists or observers. The main deck is home to a great deal of physical work. 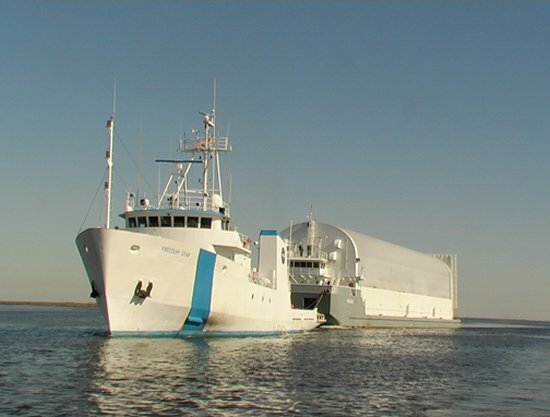 It extends from beneath the forecastle deck all the way to the aft end of the ship where today we can see the towing cable strung over the stern into the Gulf of Mexico on to Pegasus. The main deck houses a general purpose workshop which in turn houses the main deck air conditioner, storage for a wide assortment of hand tools — some that you would easily recognize because you have them in your own garage and some you wouldn’t, storage for diving equipment, air compressors, emergency fire fighting pumps (Aarg! ), an emergency generator and welding equipment. Elsewhere on the enclosed portion of the main deck we find a small lounge for recreation (maybe we’ll get to see Master and Commander, the movie), the cooks’ quarters, Bosun’s storage area forward in the bow, and most importantly the galley and the mess hall located mid ship. More to follow about the food… but generally breakfast is 7a.m. to 8 a.m.; lunch is 11 a.m. to noon and dinner is 5 p.m. to 6 p.m.
Outside in the weather portion of the main deck, we find a hyperbaric chamber for diver emergencies, a large double drum winch for towing operations, a large H-shaped structure through which the towing cable is passed, appropriately named the H-bit, the parachute reels used for booster recovery now stripped down to bare structure, and the Ambar boat. Fixed to the very aft of the stern on the main deck is a formidable device called the Texas bar, some 14 inches in diameter and 30 feet long it serves to help secure the towing cable and to accommodate side to side movement of the tow cable when the ship is underway, as we now are. A lot of physical work going on here also and we now are below the water line. Here we find the all important engine room housing the main propulsion for Liberty Star, two main engines made by General Motors providing a total of 2,900 horsepower turning two-six-foot propellers with controllable pitch. Controllable pitch provides greater response time and maneuverability. The engines generate 900 revolutions per minute (rpm) at full speed and at idle about 400 rpm. The Chief Engineer and the Assistant Engineer share continuous six hour watches monitoring the engines. 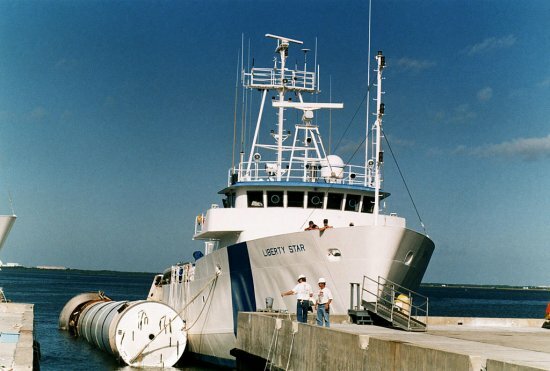 Without these engines, Liberty Star could be in trouble. We also find two DD871 generators for providing electrical power for the vessel. Aft of the engine room is the very aft end of the ship, a very cramped area called the lazarette. Here the rudder posts and steering gear are located. Forward of the engine room is the engineer workshop. Here we find a fire suppression system for the engine room (Aarg! ), more tools, and more fire-fighting equipment (Aarg!). Actually there some ten fire fighting stations located throughout the ship (Aarg!) and numerous fire extinguishers (Aarg!). Actually, all this fire-fighting equipment is a good thing; ready for any emergency and safety first. Also, throughout the ship we find numerous hand-held telephones powered only by sound; electricity not needed. Ships can lose power. The Army has similar phones called TA-1/PTs. You can see what these formidable phones look like in many World War II movies. Forward of the engine room we find nine staterooms for the crew, all simple straightforward sleeping areas with no frills and shower and bathroom facilities. Also, we encounter one of the ship’s manually operated watertight doors, which I presume is only used when you are torpedoed (Aarg!) I immediately have a vision of water pouring through the ship, sailors being pulled through doors as they are being cranked closed, like in those World War II movies. Aarg! Too much imagination for one day! That’s the layout of Liberty Star and her sister ship, Freedom Star as well. Neat little hard-working ships. Spiffy. Ship-shape, just like you would expect. I’ll never sail on a cruise ship again. Too big! Hi everyone! We’re here at Michoud Assembly Facility waiting to sail with ET-134 to the Kennedy Space Center. Thought I’d share with you a little history about how NASA developed the logistics system to move and support all this heavy, outsized spacecraft hardware. When the space program kicked into high gear in the early 1960s the equipment necessary to move the very large components of spacecraft did not exist. In fact, the lack of necessary equipment almost became a limiting factor when preparing spacecraft designs and considering how to move them to launch sites, the primary location being Kennedy Space Center, Fla.
An agency-level logistics office was created at NASA Headquarters in Washington to orchestrate and coordinate a complex set of requirements based on a new and developing program, the Saturn/Apollo Program, and very geographically dispersed set of players, including various NASA centers, test sites, launch sites, suppliers, contractors, and manufacturers; an amazing challenge. Eventually, with assistance and vessels from the U.S. Navy, NASA developed its own ocean-going fleet of seven barges capable of transporting most of the components of the Saturn/Apollo program from home bases to Kennedy Space Center for launch operations. 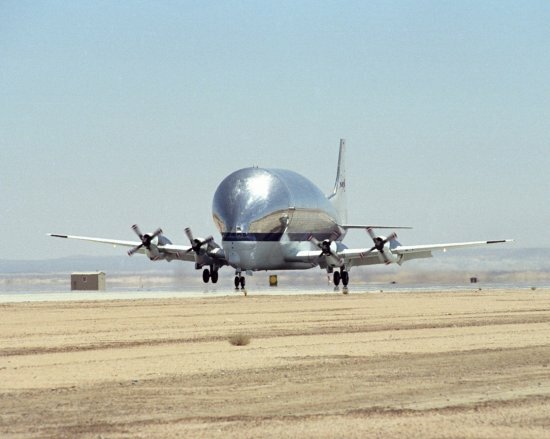 A smaller fleet of two oversize and heavily modified aircraft known as the Super Guppy and the Pregnant Guppy were procured for movement by air of Saturn F-1 engines, lunar modules and S-IVB stages. Also, NASA made use of the railroads for moving Saturn propellants and even U.S. Army CH-47 helicopters to move large components from long distances for testing at Marshall. The Space Shuttle Program inherited significant experience and a well-oiled logistics machine from the Saturn Program. 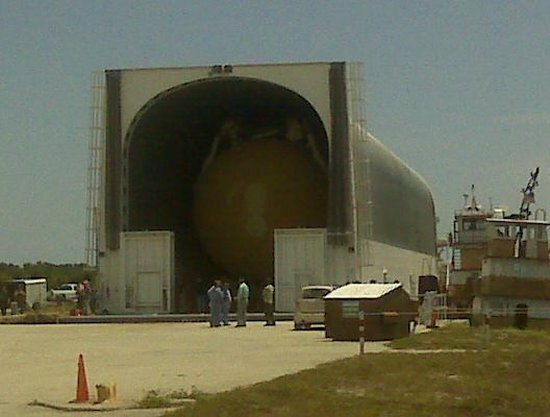 Shuttle components are moved by a wide variety of outsized transporters just as in the days of Saturn/Apollo. 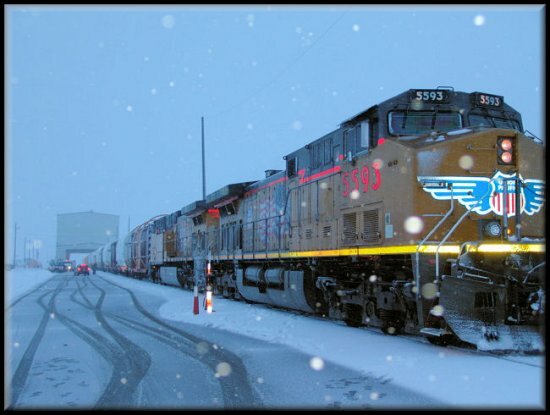 Today, components that make up the solid rocket motors (segments and aft exit cones) are transported cross-country via rail beginning in Utah where they are manufactured. 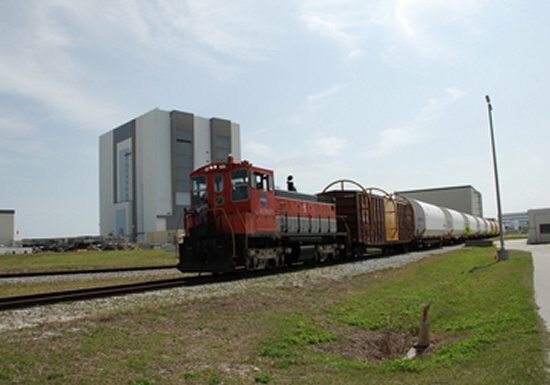 With the help of multiple railroad companies, these components typically spend less than two weeks riding over the rail before arriving at the Kennedy Space Center. Once the components are offloaded, assembled, and ultimately flown in space, they are recovered, disassembled, inspected, and ultimately the segments are transported back to Utah on the same rail that brought them to Kennedy. At this stage in the process the hardware is refurbished and made ready for future flight opportunities. 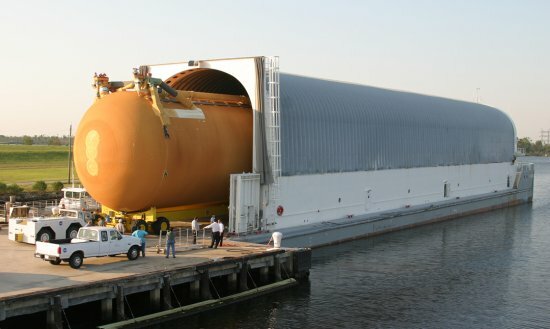 Solid rocket booster components (forward assemblies, aft skirts) are manufactured at the Assembly and Refurbishment Facility at KSC and transported via ground support equipment over the Kennedy road system to the respective Kennedy facilities where these components are integrated with the solid rocket motor segments. Solid rocket booster hardware and solid rocket motor hardware, when integrated together, make up the space shuttle reusable solid rocket booster. Essentially, NASA is a railroad man as well. 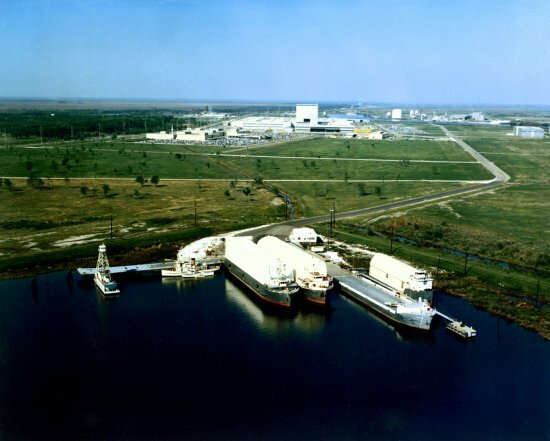 External tanks such as ET-134, as you know already, move by barge and towing ship from New Orleans to Kennedy Space Center over water and space shuttle main engines move by truck. 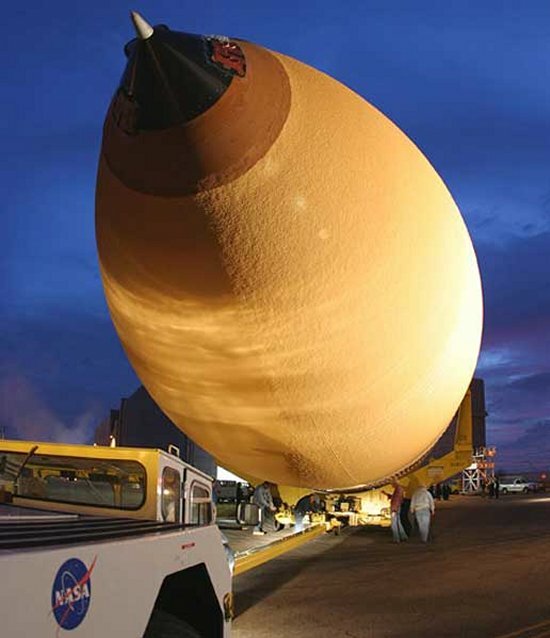 Some NASA equipment, such as specialized cargo or payloads for the International Space Station are moved by Super Guppy, stationed at Ellington Field in Houston, Texas. The space shuttle orbiter flies everywhere it goes, except for short distances over ground at Kennedy. 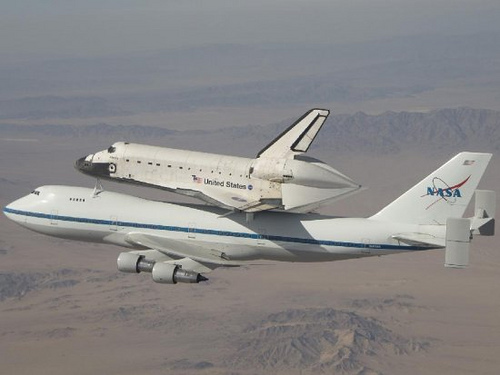 If the orbiter has to land away from Kennedy due to weather, such as at Edwards Air Force Base, Calif., a special Boeing 747 pulls up and flies the orbiter back to Kennedy “piggy-back” style in just a few days. 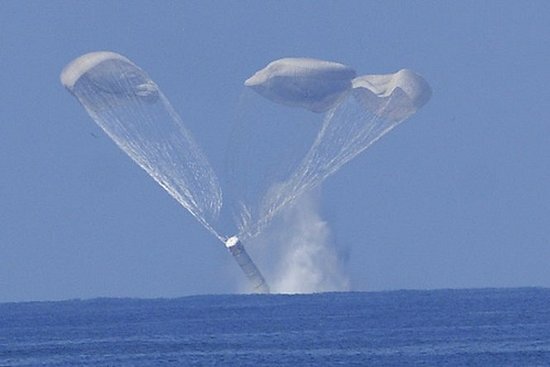 Future space program hardware will likely make use of this same or similar means of transportation for movement from point of origin to the Kennedy Space Center for launch operations. Liberty Star’s mission to tow ET-134 to Kennedy is essentially part of a bigger NASA logistics operation. It has been said that logistics is everything. It may be. You simply have to have the “right stuff” at the right place at the right time…to make a difference.